Everything felt familiar getting back on the water after a week-long break, except for this time I was solo. 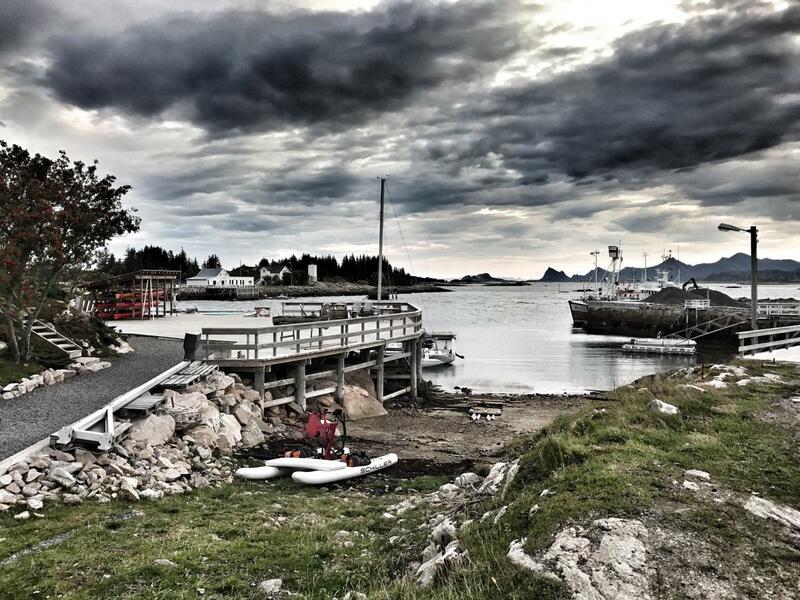 Luckily, in the first of a string of kind offerings from the locals, a forklift driver from Nor Lines in Finnsnes lifted up my Schiller Bike and drove it the 500 metres to the small pontoon which had greeted us a few days earlier. I spent the evening with Ruth and Vidar, and the cabin owners Astrid and Ernst, eating, drinking and hearing tales of history from this area. Outside a storm raged, and I couldn’t have been more thankful not to be camping! The next evening, another 20 miles south and east, I responded to a Facebook invite to stay at a new fishing and activity ‘resort’ called the Jaeger Adventure camp, in Kastneshamn. Trond was waiting for me on the pontoon, a man shaped like a tree trunk with fingers so thick it was clear that he’d been working since the day he was born. Trond showed me to a cabin and then switched on the sauna before inviting me to join him for dinner. I started to wonder whether I’d ever need to use my tent and stove again. The next morning was calm and I made plenty of ground, a relief after two relatively short days. 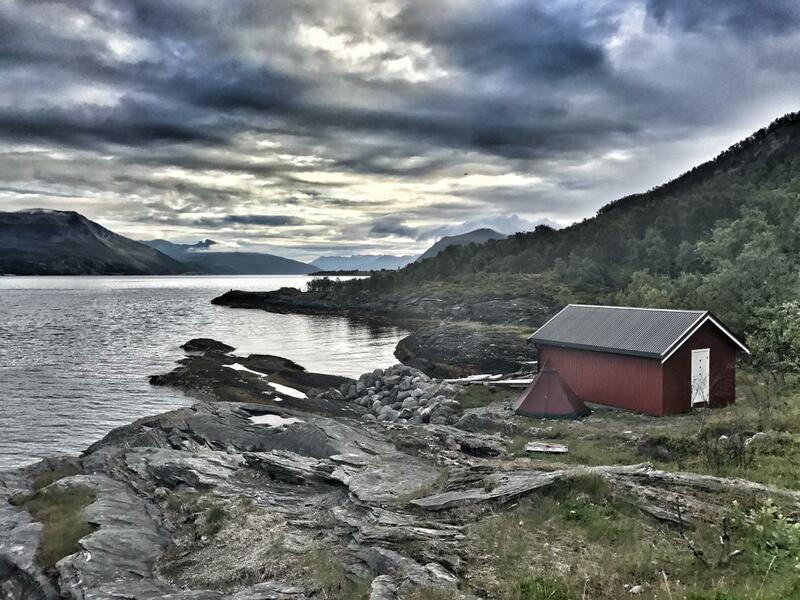 The Norwegian coastline is long and it doesn’t get travelled by sitting around talking about reindeer, but the conversations of my new friends rang around my head as I edged along fjords, beneath bridges and past salmon farms. 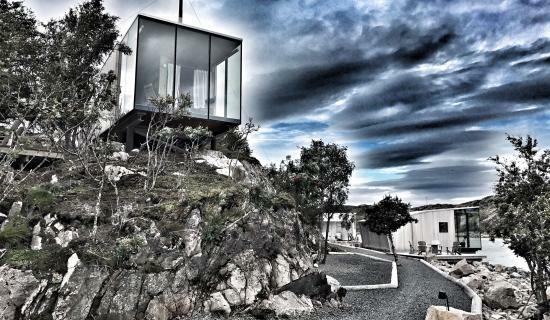 The next big challenge came in the form of the Tjeldesund, a narrow fjord separating the mainland from Hinnøya, the largest island on the Lofotens, which are a collection of islands streaming off to a point in a blaze of other-worldly beauty. The Lofotens are a pearl for the Norwegian tourist board but, mainly because I travel at 3 miles per hour and need to reach Bergen before Autumn sets in, I’ve decided to cut through on the inside of the island chain. This decision brings both frustration and joy over the next two days. The Tjeldesund is famous for having extremely strong currents, sadly flowing northerly, in to my face. Their strength changes throughout the day and I’m lucky enough to be invited in for eggs and bacon by a group of families who stare open mouthed at my water bike as I arrive at their campsite’s beach. ‘You’re crazy,’ they all wonder, one by one. Compared to the morning’s conditions, this evening was sent from the Gods. 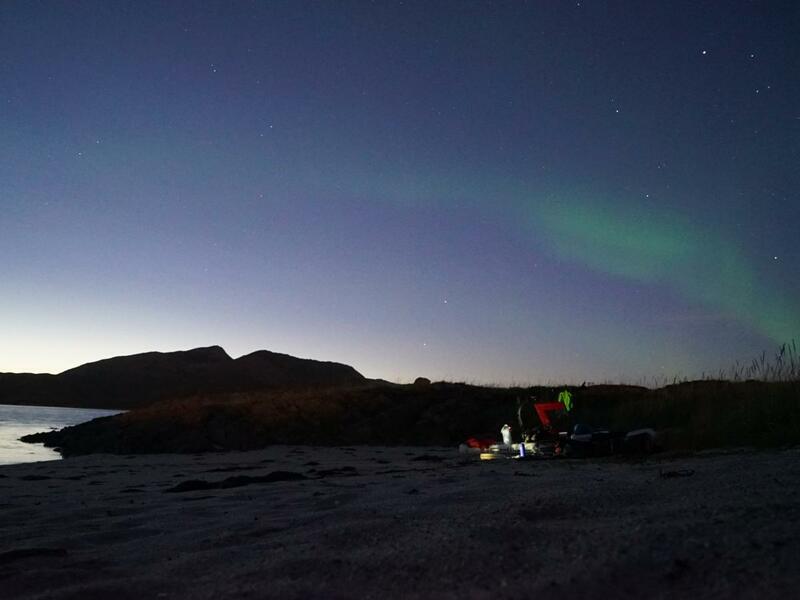 The water was like glass and I practically sprinted past Lodingen and out of the southern mouth of the Tjeldsund, eventually finding an island in twilight and settling down on a beach as the Northern Lights danced above in a cloudless sky. A 15 mile crossing of the Vestfjord was rewarded with lunch and a coffee at Tronøy Fyr, a lighthouse-turned-hotel perched in a glorious position on the mainland, and then I plodded on happily, making my way past bays and headlands, sheer cliffs climbing towards the sky to my left, the shadowed mountains of the Lofotens slowly becoming smaller as the Vestfjord widened to my right. 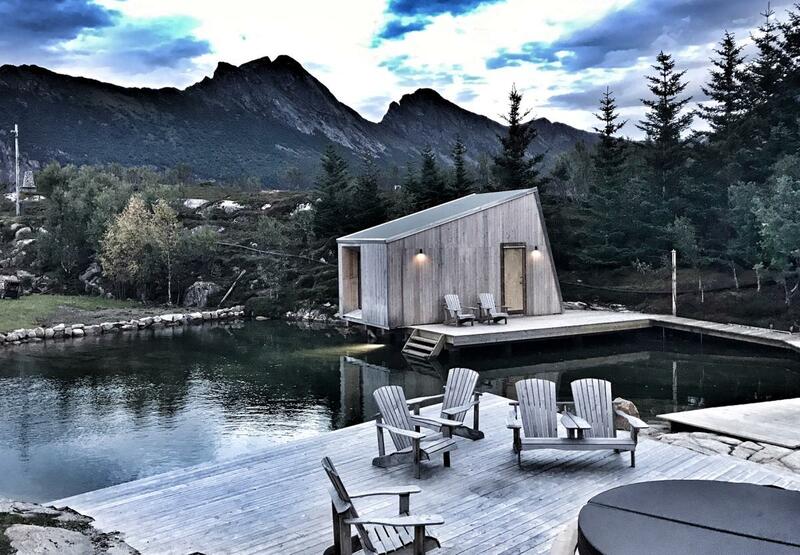 The next day I stopped for a coffee at a fishing village, where Tommy and Katalin keep a series of waterside cabins and rentable boats in immaculate condition. ‘Would you like to stay for the night?’ they ask, but the day is too young and I decide to push on. Ten miles and two wind-blown fjord crossings later I edge towards Nordskot, a deliciously beautiful little village which boats high speed ferry access from Bodø, the big city around 50 miles further south. It turns out that I’ve landed on Mannshausen, the home and now resort belonging to famous Norwegian polar explorer Børge Ousland. And the young man who invited me in, his son, Max. 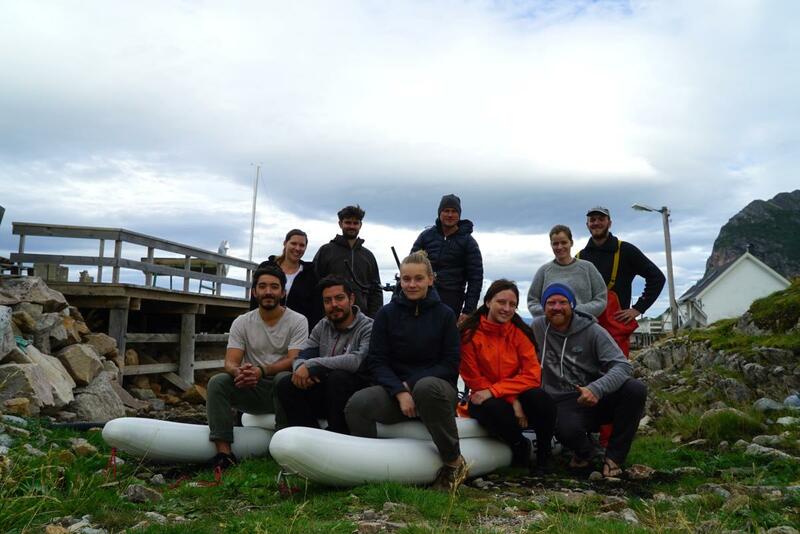 I spent two days on Mannshausen waiting for the winds to die, enjoying the company of a fantastic, multi-talented team of volunteers who have travelled the world to spend some time here. 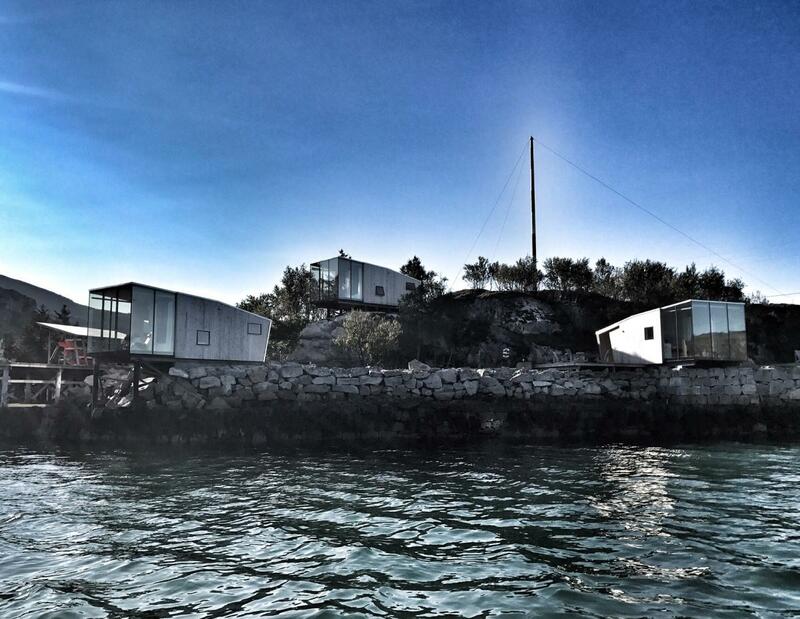 Meanwhile, guests enjoy the most stunning accommodation in futuristic glass-fronted waterside cabins. I’m sad to leave, but the endless islands of Steigen make for beautiful water time, and I only wish I could stop longer and camp on each sandy beach that I pass. 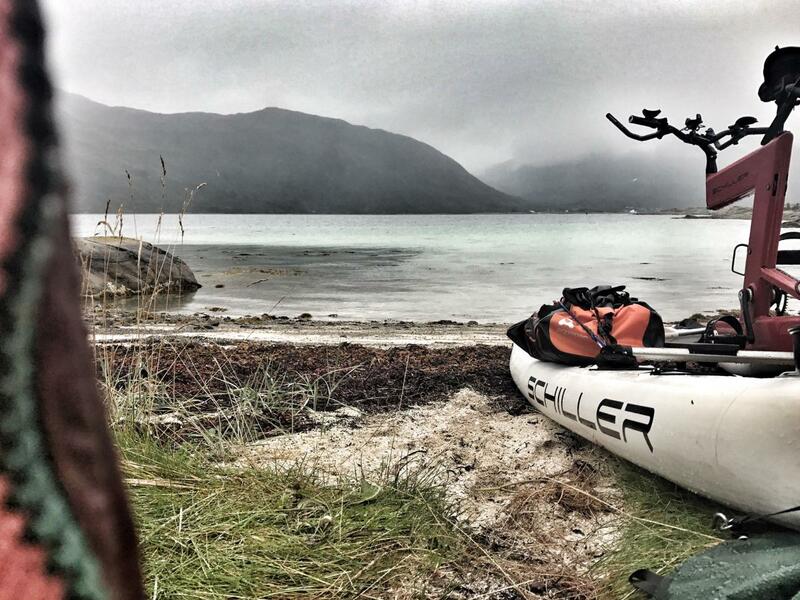 The next day I reach Bodø and cross my halfway mark on this journey. 700 miles complete so far, the rest is downhill. See where Dave is right now and more background information about this trip. Also read Dave&apos;s previous blog posts.